Also great for Nurse, Doctor, Medical Student, etc! Body: 92% acrylic, 6% polyester, 2% spandex. Cuff: 74% acrylic, 18% polyester, 6% rubber, 2% spandex. Hand wash separate with cold water. Do Not Bleach. Dry Flat. Do Not Iron. 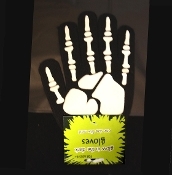 *Please Note: *These Gloves GLOW in the Dark after exposure to bright light!